You must be 25 years old to rent this condo. Nestled between Mobile Bay and the Gulf of Mexico near the end of the Fort Morgan peninsula, this 4th floor condo overlooks an invigorating saltwater pool with its cascading waterfalls and extra large hot tub. Just beyond the pool area are pastel colored homes and the beautiful emerald waters and our famous sugar white sand beaches. The generous extra-large balcony features a beach day bed for a relaxed read. Enjoy the balcony height dining set for unimpeded views and candle light dinners. There is a fully equipped kitchen with chef quality utensils and an abundance of cookware. Complete with four flat screens, cable TV, DVD players, WIFI. Just off from the dining room is a large master bedroom with 9' high ceilings, with floor to ceiling sliding glassdoors, private balcony entrance, and double sink en suite bathroom with a garden tub. The king sized memory foam mattress is one of the most comfortable beds imaginable. A walk in closet adjoins the room. The condo is tastefully decorated with just the right touch of beach decor. There are two bay view bedrooms as you enter the condo, one with a queen sized bed, closet and private entrance toone of the large baths. The third bedroom has two single beds, and a large walk in closet. The dresser is located in the closet to maximize space. 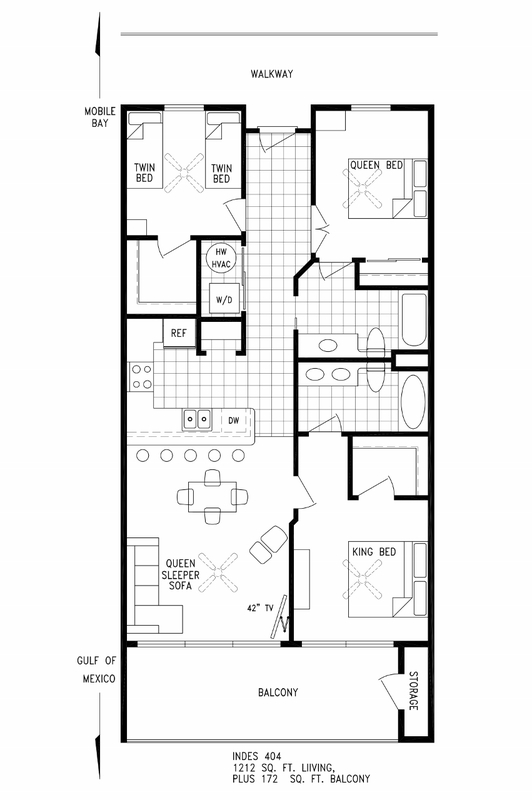 The kitchen is open to the dining / living room which leads to the floor to ceilings glass entry doors to the balcony. The living room also has a queen sleeper sofa bringing the total number for beds to eight! A quick ride up to the 8th floor sun deck offers a panoramic view of the Gulf of Mexico, Mobile Bay, Sand Island House and Dauphin Island. The exquisite sunsets rival those found in Key West or Caribbean. Being away from the back scatter of city lights, the twinkling lights of the Gulf of Mexico merge with star filled skies. Tacky Jacks is a short 3 minute walk away, join the natives and try your hand at karaoke, you'll fit right in. They have a restaurant that serves indoors and on an outdoor deck and in the marina so that you can enjoy more of the outdoors. The Indies Condo is located 20 minutes from the crowds of Gulf Shores. There are three local restaurants within 6 miles of the condo. The Indies Condo and Dunes community feature a 1000 ft. private gated community beach just a 3-4 minutes walk. There is an additional community pool and hot tub. Walk down the beach for a mile past the wild life refuge to Fort Morgan. "Fabulous stay @ Indies 404 !! Bright, welcoming & spacious !! Everything you could ever need - comfy beds & immaculately clean !! Wonderful stay at your condo. Perfect location for a relaxing beach weekend. Kitchen well stocked for cooking. Best of all oh THE VIEW !!!!! " Can Not Wait To Get Back! "My husband and I stayed in Indies 404 in April, and we have already booked again for September! This condo is comfortable and spacious with a great view and a short walk to the beach. We LOVE the location, which is less crowded than Gulf Shores and Orange Beach. Dining options include Sassy Bass and Tacky Jacks, which are delicious. We also opted to stay in one night and cook in the fully-equipped kitchen. This is the perfect get-away, and we cannot wait to get back! " "My husband and I just celebrated our 25th anniversary in the best way possible, peace and quiet at the Indies 404. The condo was beautifully decorated and made us feel like we had travelled to a far away island. It was a great place of relaxation and refreshment! We enjoyed sitting on the balcony, the beautiful view of the gulf and beach without any noise, short walks to the beach, touring Fort Morgan, eating at Tacky Jack’s and Lulu’s and shopping at the Tanger Outlets. We could do as much or as little as we wanted! I highly recommend this condo if you are looking for a great getaway! The owners are great hosts and were very attentive to our needs! Thank you for a great experience!" "The 3 bedroom condo was amazing. The view was awesome. We could see Sand Island lighthouse on the Gulf side, and we watched the Carnival ship "Fantasy" make its way from the bayside to the Gulf side. The condo was well equipped with every kitchen utensil you could imagine. There was even a French press coffee maker! The beds were very comfortable. The pool was beautiful and spacious. The Gulf beach was also very relaxing. It was good to know my car was safely parked in the garage during an evening thunderstorm. My family loved it!" "My wife and I spent a long weekend at Indies 404 and had a terrific time! Great place to unwind with all the comforts of home! Everything was perfect and we will be back. I would highly recommend this condo! " "Indies 404 is a beautifully decorated spacious condo with 3 bedrooms and two full baths. Each bedroom had a flat screen TV with all the popular channels. It is large enough to entertain 8 people comfortably. The kitchen had all the appliances you would need to prepare a great meal or a relaxing drink. The condo had great cable connections and a great WIFI signal which is important in this digital age. The Condo overlooks the pool and has a great view of the neighborhood and gulf. The property had great security that monitored the pool area and surrounding property. We truly had a great “family” time at Indies 404. I especially loved the artwork. We enjoyed our stay so much we have scheduled another visit for later on this spring. " "Spacious and well-kept with great views of the Gulf. Whether you want to go to the white sand beach, hang out by the pool, relax in the hot tub or just sit and take in the view on the large balcony this is the place for you. I know we will be back! " This is a place you will definitely want to come back to. "If you are looking for a quiet getaway this is the place to be. The condo is so beautiful and has everything you need. The bedrooms are decorated very nicely and the bathrooms are very spacious. I loved the balcony area with its wonderful views of the gulf. The balcony has a couch for reading or napping and a table where you can enjoy your meals while you are enjoying the scenery. The owners have gone above and beyond to make sure this is a place you will definitely want to come back to. " "The winter was a little colder this year ,but we still found plenty of things to do, and keep busy with. " "We were so glad to have you back this past winter, and, yes, it was a little colder this past season than the previous year. Hopefully, this coming winter will be milder! Thank you for the review!" "The Sunset Property's staff make it easy for all your arrival and stay needs." "Awesome! Thank you so much! We try to make it as easy as possible for our guests so they can focus on relaxing and enjoying their stay! We look forward to seeing you again!" "This place is a MUST stay!!! Great location, fabulous accommodations, and good price. We enjoyed our stay so much , and so did our 3 little girls. We can’t wait to go back. We had zero issues getting into the condo or with anything there. Easy to deal with for reservations too. " "Thank you so much for sharing about your stay at The Indies! We love positive feedback! The installment of the electronic locks makes the check-in process so easy for our guests. No hassle of keeping up with keys or having to stop by the office for check-in. We hope you give us a call when you are ready to come back!" "We had a wonderful time at the Indies 404. The rooms were very nice. The beds were comfortable. We loved the views the most!" "Yes! We agree, the views are awesome!! We were so glad to have you!" "Wonderful experience at Fort Morgan, loved being away from crowds of Gulf Shores. The condo was wonderful. I am very picky when it comes to cleanliness and it ranked a #10 for being clean and nice new clean utensils. Within a block to the beach, which was not crowded." "Yay!! Tami, we are so glad to hear that you enjoyed your stay here with us! It IS such a great condo, and we hope you can come back and see us soon!"